The Nexus 6 is still a great device if you don't mind a gargantuan, pocket-busting phone. It has Android 6.0, a good screen, excellent build-quality, and it's really cheap. Usually, when we post a Nexus 6 deal, it's for the 32GB base model. 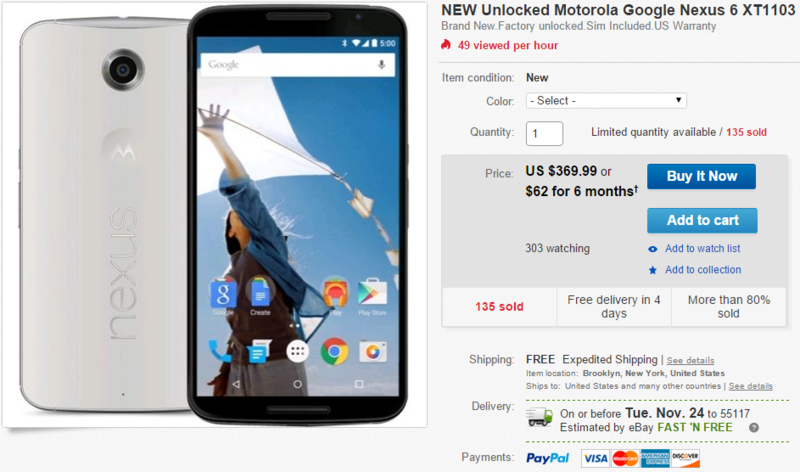 Not this time—today you can get the 64GB Nexus 6 for a mere $369.99. This is a new device, not refurbished or open box. You have your choice of blue or the more elusive white model too. The 32GB normally goes for around $300 on eBay, so $370 for double the storage seems acceptable. Google is still selling it for an insane $550, and it's about $400 on Amazon. This is the North American variant (XT1103), but the seller does offer shipping to a number of other countries for a price. US shipping is free, but you'll have to pay tax in New York.